In the end of Chapter Seven, I had this awful wonderful idea. That does not make sense to anyone but me because I have kept rather shut about this and the last novel. I wonder if that’s why they’ve gone so well. I should try to keep progress updated with details when I do Camp NaNoWriMo again in August. Naming names should come first, or else this will not make a lick of sense. Synda is a red cap (murderous fey) who works and lives with Driscoll, a satyr. He’s effing terrified of her because of her killing culture and personal attitude. 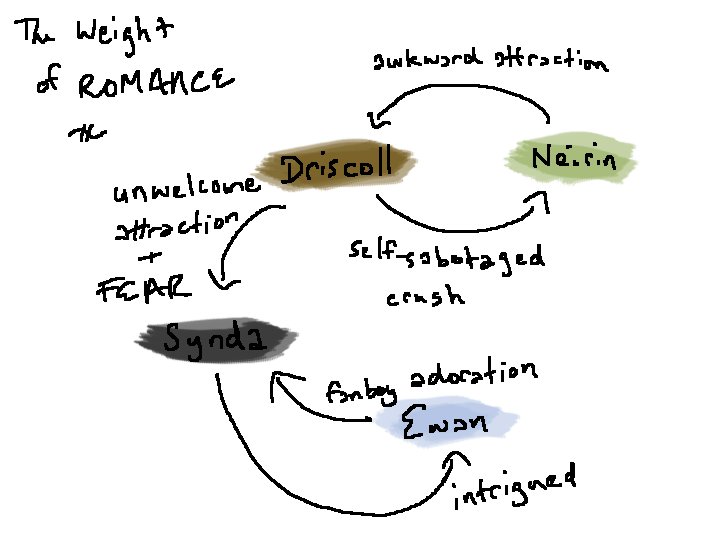 Neirin is a human sorcerer who shared a drunken night with Driscoll and wound up at the flat. It’s not clear yet whether they actually did anything, but a lot of assumptions have been made. Ewan is a banshee who admires Synda (as she is a red cap) and follows her around with a vacant smile. Because Synda is actually kind of hot, Driscoll has shown these weird signs of being attracted to her–which considering the fact that he has an oft-hidden but ever-present expectation that she will most definitely kill him for serious one day, is swiftly becoming a hilarious development. Near the end of Chapter Seven, he has to see to a rather nasty wound in her arm, and starts bumbling all over himself while confessing something he finds particularly embarrassing. And then I had the idea for Ewan to pop in and complicate matters. This made me realise that I had somehow crafted a love triangle thing with more than three. So… love quadrangle. Not an original term, but rather fun to say. I made it a chart.